According to preliminary data from national statistics office ISTAT this morning Italy's GDP fell 0.3 percent in the second quarter compared with the first three months of the year and was unchanged year-on-year (ie zero percent annual growth). Final data and a detailed breakdown for the second quarter will be released on Sept. 10. In the first quarter, GDP rose 0.5 percent quarter-on-quarter and increased 0.3 percent year-on-year. European Central Bank President Jean-Claude Trichet stated yesterday that economic growth was expected to be "particularly weak" in the third quarter after bank policy makers left borrowing costs at 4.25 percent, so it is not unreasonable to anticipate a second consecutive quarter of negative growth in Q3, and hence in all probability Italy is now in recession. Italian consumer confidence in July slumped to the lowest since 1993, when the country was also - we should note - in a recession following abandonment of the EMS. The Isae Institute index fell to 95.8 from 99.9 in June. In November 1993, the 26-year-old index hit a record low of 95.4. 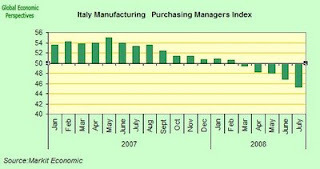 Italy's manufacturing sector contracted for the fifth straight month in July, posting its weakest performance in over six-and-a-half years, according to the results of the latest Markit/ADACI PMI survey. The Markit Purchasing Managers Index dropped to 45.3 from June's 46.9, sinking further below the 50 divide between growth and contraction. 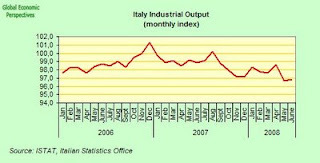 If we look at the seasonally adjusted output index we can see that Italian industrial output has been dropping almost continually since the November/December 2006 peak, and we might well ask ourselves the question, with energy prices up where they are when will this index ever rise again abover the late 2006 peak? 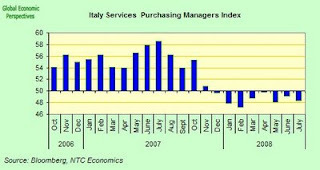 The Italian services sector purchasing managers' index also in fell in July, to a seasonally adjusted 45.6 in July from 48.5 in June. So the contraction continues, and even accelerates into the third quarter of the year. 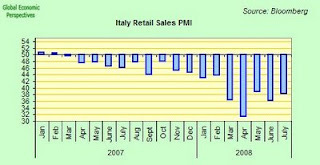 And Italian retail sales declined in July for the 17th month in a row. The seasonally adjusted PMI for retail sales was at 38.2, up slightly from the 36.3 shocker registed in June. Earlier this week Italian Prime Minister Silvio Berlusconi survived a confidence vote in parliament over plans to raise taxes on oil companies and reduce salaries for mayors and public employees in a bid to balance the budget by 2011. 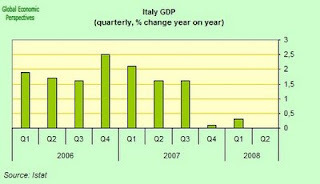 Italy currently has a debt to GDP ratio of around 105% - way above the official EU limit of 60%. Italy is commited to at least achieving the common target of a balanced budget by 2011, but this looks to be fraught with difficulty to me, given Italy's very poor economic performance and all the negative headwinds going forward. Berlusconi managed to clear this particular hurdle this time round without too much difficulty, since his allies in the lower house of parliament voted 312 to 239 to approve the necessary amendments to current legislation, and then passed the entire package 314 to 230. The budget increases the corporate income-tax bracket for energy companies to 33 percent from 27.5 percent and raises taxes on oil and gas inventories. Banks and insurance companies also will pay more. Finance Minister Giulio Tremonti has called the measures ``Robin Hood'' taxes. On the spending front, the government plans to cut city, town mayor and local administrator salaries by 20%. It is not clear how much of this is serious and how much "window dressing", but since the government estimates that budget cuts at ministries will generate savings of 9 billion euros ($13.9 billion) next year, the salaries of more than a few mayors and public dignataries must be involved. The broader economic policy outlined in the budget aims at boosting revenue and cutting spending by 36 billion euros over the next three years. And even with these cuts the deficit is expected to widen to 2.5 percent of gross domestic product this year from 1.9 percent last year, largely as a result, of course, of the current recession. 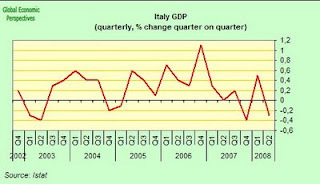 Now, if the Italian government are serious about this, and we will need to watch and wait to know since past performance is far from reassuring, then it will leave us with the clear possibility going forward of seeing an Italy with negative GDP growth in full years 2008, 2009 and 2010. Since the little average underlying net growth that Italy manages to achieve these days will largely be undermined by cut backs in government spending and the impact of continuing high energy prices on headline GDP growth. So the big question is: are the Italian people ready for three consecutive years of falling living standards and cuts in everything, or is Berlusconi going to have trouble holding his coalition together? As anticipated on this blog (and in my two posts on RGE European EconMonitor - here, and here) the German economy contracted in the second quarter, possibly by as much as 1% according to the Süddeutsche Zeitung newspaper who somehow or another seem to have gotten an advance glimpse of the economic data which is due to be officially released next week. 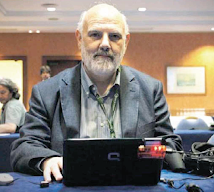 The Financial Times reports that government officials initially declined to confirm the report but that one spokesman later told the Financial Times: "The contraction will be in the order of magnitude of minus one per cent." The official added: "Bear in mind, though, that this is partly a correction after the exceptionally good first quarter." This decline in economic output, if confirmed, is pretty steep and shows that the German economy, like much of the eurozone, is now possibly staring a looming recession straight in the face. What most analysts seem to have failed to notice was that the 1.5 per cent jump in growth registered in the first quarter – which was the fastest increase in almost 12 years – contained a very strong (0.7%) component due to a sudden sharp rise in inventories. Strip these out of the second quarter - as inventories are reduced again - and you are bound to see some sort of significant correction. Add to this that demand for German exports is slowing, and you get contraction. What we now need to see is the extent to which this negative momentum carries over into the third quarter. data out of Berlin could be intended to influence the European Central Bank ahead of its scheduled meeting on Thursday, when it is expected to leave interest rates on hold. Cough, cough, cough. One indication that the contraction may well carry through into the third quarter was provided by the news this morning thatGerman factory orders fell for the seventh straight month in June. Orders, adjusted for seasonal swings and inflation, declined 2.9 percent from May, the Economy Ministry in Berlin said today. That's the biggest drop since July 2007. Orders were down 6.1 percent from a year earlier. Now this news is important, since it will be reflected in the July and August industrial production numbers. Foreign sales dropped 5.1 percent, while domestic orders fell 0.6 percent in June. Orders from the euro area declined 7.7 percent and demand from outside the region fell 3.1 percent. That is, the position is clear, economic problems in Spain and Italy are slowly but surely dragging German export growth down, and when Germany has no export growth then recession is guaranteed. The euro area, which takes just over 40 percent of Germany's exports, probably contracted 0.5 percent in the second quarter, according to the latest estimate from economists at the French bank Societe Generale. August is going to be a long month for Spain. All those people lying on the beaches reading such depressing news day after day. We have three more gloomy inputs since last Friday. Spain's manufacturing economy shrank in July at the fastest rate ever seen in any European Union survey of the sector conducted by Markit, the research organisation said on Friday. 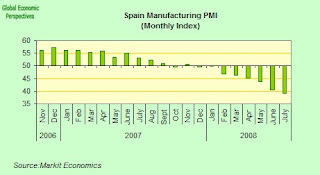 The Purchasing Managers Index for Spain slipped to its lowest level since the survey began in February 1998, Markit said. The Markit Research Manufacturing PMI index contracted for the eighth consecutive month to 39.2, down from 40.6 in June. Any PMI figure below 50.0 shows contraction while figures over 50.0 show growth. 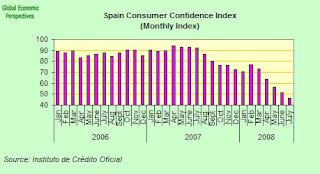 Spanish consumer confidence fell to a new historic low of 46.3 in July from the previous record low of 51.7 hit in June, according to the Official Credit Institute (ICO) this morning. A reading of less than 100 indicates pessimism about the economy exceeds optimism. The index started in September 2004. 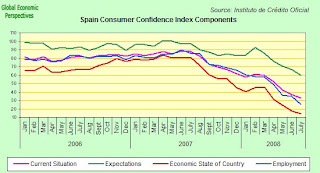 The index has only risen in one month (February, just before the elections) in the last 15. All the sub components were also down. 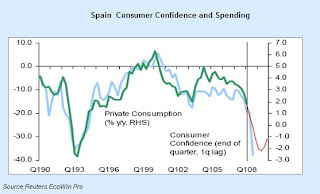 To help us understand how all this works, and what such a reading might imply, PNB Paribas have kindly prepared a nice chart which overlays consumer confidence (with a 3 month lag) over consumer spending. If this chart continues to give a reasonable representation, then we may expect consumer spending in October to be dropping in much the same way as consumer confidence has just fallen in July. Spanish consumers may find yet another reason to get pessimistic in a survey of European housing published by ratings agency Standard and Poor's last Wednesday. According to S&P's estimates UK house prices are set to fall by a quarter in total but could find a floor next spring, unlike in Spain, which is set for a longer housing correction. S&P said the average cost of a house would revert to about 4.4 times average annual earnings - near back to where it was in 2000 - if prices fell by 25 percent overall. S&P said such a drop implied another 17 percent fall for UK house prices, with a trough occurring in April or May 2009, given the market's current rate of decline. The market is down by almost 10 percent since August 2007. Spain was also likely to see 25 percent peak-to-trough drop in house prices, according to S&P's, but a cocktail of higher interest rates, excess housing supply, and a darker economic climate meant it would take longer to get there, S&P's said. Standard & Poor’s, also estimated that there are 1 million homes currently looking for a buyer, 500,000 of them newly built. One developer’s association recently forecast as many as 750,000 newly built homes on the market by the end of 2008. Registered unemployment in Spain, where construction firms added more than a million jobs this decade, increased for the fourth consecutive month in July. 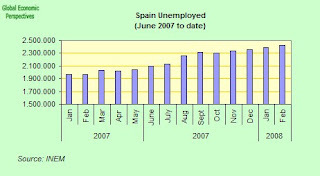 Unemplployment has only fallen now in one month (February, just before the elections) in the last eleven. The number of people claiming unemployment benefits rose 1.5 percent, or 36,492, from the previous month to 2.43 million, according to the Spanish Labor Ministry. From a year earlier, the number of claimants increased by 23 percent, or 456,578. Home sales and mortgage lending slumped by more than a third in the year to June. Jobless claims among construction workers grew 5.4 percent in July over June. Unemployment in service industries was up 0.8 percent on the month.